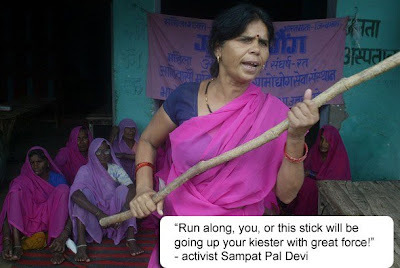 You are hated: Sampat Pal Devi is a badass! Think you've got it rough? Try living in Banda, Uttar Pradesh, one of the poorest regions in India. As an Untouchable. A female Untouchable. Lower-caste chicks have a mighty tough row to hoe around those parts. And Sampat Pal Devi decided to do something about it. The mother of five has formed a gang - dressed in pink and armed with sticks! - called the Gulabi. Targeting abusive men, as well as the corrupt local cops who protect them, the gang is now several hundred strong. Where they see abuse, the Gulabi will harrangue, harrass and, if necessary, bring the hurt to husbands who beat their wives, fathers who force underage daughters into arranged marriages, and officials who prevent the poor from receiving their public grain allotment. "We don't want donations or handouts," the Gulabi insist. "We don't want appeasement or affirmative action. Give us work, pay us proper wages and restore our dignity." I'm not about to argue with them. They've got sticks!